← Want to Know What’s Really Happening in Maine Real Estate? The MEREDA Index Has More Than Just The Numbers. A record of nearly 1000 of Maine’s real estate professionals gathered on January 17 to hear experts give statewide economic projections at the Maine Real Estate & Development Association’s (MEREDA)’s annual Forecast Conference, sponsored by TD Bank, in Portland. 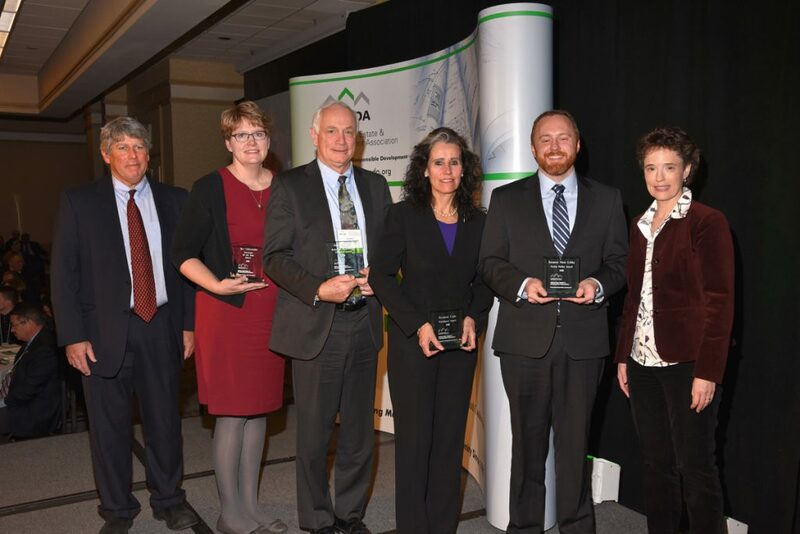 In addition to a daylong event featuring economic overviews by region and by industry, the 2019 MEREDA Forecast Conference included an awards ceremony to recognize four outstanding industry professionals, each selected for their contributions to MEREDA and, more generally, to the health of the Maine real estate market over the last several years. Watch a video of MEREDA’s 2019 award winners. Noel Graydon, of Kennebunkport, was selected for the Robert B. Patterson, Jr. Founders’ Award, for his significant contributions to the state’s real estate industry and stalwart support of MEREDA over the years. An active member of MEREDA’s Board of Directors from 2009-2018, Noel also served on MEREDA’s Membership & Marketing Committee, and was recognized with MEREDA’s Volunteer of the Year Award in 2011. MEREDA is also appreciative of Noel’s and Norway Savings Bank’s involvement and support of MEREDA’s morning menu breakfast series over the past 13 years. With a banking career spanning over 40 years, Noel has worked in both commercial and retail banking and held executive positions in regional and community banks across New England. Most recently, Noel has served as Regional Vice President of Commercial Lending for Norway Savings Bank and is responsible for the bank’s commercial lending in Southern Maine. Noel is also active in his community as a youth hockey coach and firefighter. He has been with the Kennebunkport Fire Department for the past 25 years where he serves as the district chief. This year’s President’s Award went to Roxane Cole of Falmouth, in recognition of her significant contributions on MEREDA’s behalf. With her 30 years of experience as a commercial broker, Roxane Cole of Roxane Cole Commercial Real Estate has made an indelible impact on Maine’s real estate industry and MEREDA. Roxane has been an active member of MEREDA’s Board of Directors since 2003, having served as president from 2006-2008. Her leadership was instrumental in her work on Portland’s Business Diversity Task Force, where she was able to help create consensus and craft a workable ordinance. For her contributions, she received MEREDA’s 2009 Public Policy Award. Roxane’s strong support of MEREDA continues—from participating on MEREDA’s public relations search committee to providing commentary for the current edition of the MEREDA Index—Roxane will always step up to help. Roxane has also served the Portland community over the years in various roles such as: past Chair of the Greater Portland Regional Chamber of Commerce, past president of Portland’s Rotary Club, founding board member of the Maine Commercial Association of Realtors, and as a founding board member of the University of Southern Maine Foundation. Senator Nate Libby, of Androscoggin County, received MEREDA’s Public Policy Award for his significant impact on public policy changes to benefit responsible real estate development and ownership in Maine. As an advocate for responsible development, home ownership, and reasonable regulation, Senator Libby has distinguished himself as a champion of the issues that matter most to MEREDA. He has demonstrated a willingness to engage with members of the development community, respond to the concerns of the industry, and serve as a tireless advocate. During his 6 years of service in the Maine Legislature, Senator Libby has sponsored, co-sponsored and supported numerous pieces of legislation of interest to our association, including bills to clarify and simplify the permitting process at the state and municipal levels. He has, in fact, sponsored several bills that were drafted by MEREDA’s public policy committee, and he has worked closely with us to help secure their passage. In addition, he has sponsored legislation to expand the Maine New Markets Tax Credit, fund the Maine Historic Tax Credit program, fund housing for seniors and support the Tax Increment Financing program. As a former property manager and a consultant in the economic development community, Senator Libby truly exemplifies the value of a citizen’s legislature, bringing his every day experiences and practical knowledge to the development of public policies for the state of Maine. Senator Nate Libby currently serves as the Majority Leader in the Maine Senate, having previously served one term in the House and two terms in the Senate, including as Assistant Minority Leader. Bev Uhlenhake, of Brewer, received MEREDA’s Volunteer of the Year Award for enthusiastically sharing her time and energy and passions with the organization. Bev has served on MEREDA’s Board since 2012 and has been an essential partner helping MEREDA grow its presence in the Bangor area. From helping to organize and emcee our Bangor-area events, participating as a speaker at several of MEREDA’s annual conferences, participating on the Public Policy Committee, to contributing to our Developer Roundtable session which helped shape MEREDA’s upcoming legislative agenda—Bev continually devotes her skills and her enthusiasm to help MEREDA and its mission to promote responsible development in the state of Maine. A broker at Epstein Commercial Real Estate, Bev works in all sectors of the commercial market and has brokered a range of sales, leases, and build to suits for local and national clients. Bev is currently serving her second term as Mayor of the city of Brewer, where she has been on the city council since 2013. She also serves as the Immediate Past President of the Rotary Club of Bangor and is involved in a number of other statewide and local organizations including the Brewer Business Alliance. Bev also ran for the Maine State Senate in 2018. Next, MEREDA will recognize notable projects from the last year in Maine commercial real estate. That awards ceremony is scheduled as part of the organization’s spring conference, on May 7, 2019. This entry was posted in Business, People. Bookmark the permalink.